Based off the same R&D for our stage 2, but using the stock 3500 valves instead. Use with our matching manifold set for optimal performance. We also offer thermal coatings to further enhance our product. Here is what you get for your money. We offer seats/seals, valve springs, retainters, and keepers, or you can take the heads as they sit and assemble your own valvetrain. 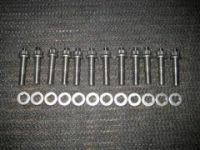 Spring pricing includes the valve stem seat/seal setup used for assembly, either stock, or our LS style seat/seal combo. Comp 26986 - Good for any of the stage 1 type cams. Torque, Street, and Street/Strip. Only spring to use stock seat/seal combination. Comp 26915 - Good for the same cams as the 26986, and the Strip cam (Stage 2). Also good for mild boost Stage 2 Turbo Cam. Comp 26925 - Double spring with matching retainers. High boost applications might consider these. PAC 1218 - Good for any of the stage 1 type cams. Torque, Street, and Street/Strip. Also good for mild boost Stage 2 Turbo Cam. Manley Steel - Machined keepers are a nicer fit than the stock stamped keepers, and the same is true for the retainers. Better fit, less weight, and more clearance above the keepers for the valve stem to rocker arm. If you have any questions, feel free to contact us with the store form, or call 574 968 7607.